If you’re not happy, we’re not happy. 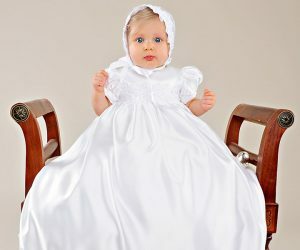 We guarantee your total satisfaction with our christening gowns, christening outfits, First Communion dresses, gifts and other special occasion products. If for any reason you are unsatisfied with your purchase at One Small Child, simply return (postmark) your unused items within 30 days, and we’ll promptly refund your money. Our goal is to do all we can to make things right with you. Please email us at [email protected] or call us at 208-680-0731. We are here to assist you! We cannot accept returns or exchanges of worn, washed, soiled, monogrammed or customized articles. If there has been a construction error on an item that has been worn, we will gladly repair it for you. Please see our return policy for more information.